Search marketing consists of two channels: PPC (pay-per-click) and SEO (search engine optimization). Both channels have advantages and disadavatages you need to consider before committing resources to either approach. Minimal Impact – Most sites won’t need to make design or layout changes in order to use PPC. SEO often requires site design changes, and these changes can be significant. Instant – Traffic can start flowing in a matter of minutes once a campaign has been launched. With SEO, traffic can take some time to build, and there is no guarantee it will arrive at all. Pay On Performance– You only pay when you receive traffic. If you do not receive traffic, you owe nothing. SEO requires a large upfront investment with no guarantees of campaign performance. Traffic and visibility isn’t directly controlled by the SEO. Precise Keyword Targeting – You chose the keyword terms under which you appear. This allows you to run tightly focused campaigns. With SEO, pages can appear under a wide range of keyword terms, and sometimes these terms are unrelated to your campaign. This can make campaigns difficult to measure. Precise Tracking And Adjustment – You get instant, precise figures, and you can adjust your campaigns in real time. SEO campaigns can be adjusted, but it is time consuming, and the results of which might not be seen for months. Landing Page Control – You decide which page search visitors see. With SEO, visitors can arrive on any page the search engine has in its index. Region Control – You control the regions and countries in which people see the ads. With SEO, you have no control over regions or countries. Buy Position – want to rank #1? You can pretty much buy it with PPC. SEO is hit and miss affair when it comes to ranking, and ranking for highly competitive keywords can be virtually impossible for new sites. Control Your Budget – You can specify how much you want to pay for any given period, and you can stop and re-start campaigns when it suits you. SEO is largely an upfront cost, and the campaign can’t easliy be switched off. Time Control – You can control when your ads are seen. SEO has no such control. Given the features and flexibility of PPC, why would people use SEO? People tend to trust the main listings more so than they trust the paid listings. The main listings receive the lionshare of attention and clicks. However, it should be noted that eye pattern studies show both high positioned PPC and organic listings achieve significantly more attention than lower ranking listings, organic or otherwise. The key location on Google for visibility as determined by the eye activity in the study is a triangle that extends from the top of the results over to the top of the first result, then down to a point on the left side at the bottom of the “above the fold” visible results. This key area was looked at by 100 percent of the participants. In the study, this was referred to as the “Golden Triangle”. Generally, this area appears to include top sponsored, top organic results and Google’s alternative results, including shopping, news or local suggestions. Some of the most powerful SEO strategies blend PPC and SEO, taking advanatge of both systems. PPC is an ideal testing ground for SEO. Typically, the SEO guesses if a keyword term is worth the time and effort of attempting to rank for that term. Perhaps the keyword term doesn’t receive as much traffic as the estimated numbers suggest. By running a PPC campaign on the keyword terms prior to implementing an SEO campaign, the SEO can get more accurate estimate of search volumes. The SEO can also test out the wording of language on landing pages to see how altering the copy to favor search spiders makes a difference to conversions. Similarly, SEO can feed back into PPC campaigns. Because SEO casts a wide net, traffic logs can sometiems reveal lucrative keyword combinations that the research tools do not. At first I thought this was going to be an article that tried to say that PPC was better than SEO. As a PPC manager I like the sentiment, but SEO and PPC are really two pieces of the same puzzle and should be used together. I’m always surprised when a client thinks we’re a genius for using PPC results to guide SEO and mining analytics and logs for PPC keywords. Most sites won’t need to make design or layout changes in order to use PPC. Not to use it, perhaps, but conversion rate optimization and landing page tweaking are as important for getting the most out of PPC as on-site work is for SEO. You could just throw links at a page with no on-site and still get results, just as you could throw PPC traffic at an unoptimized landing page and still make sales. In PPC you know the terms you want but it might not be viable for you to bid for the best position. In SEO you know what terms you want, but it might take a while to get there. I don’t see how this is an advantage for PPC. Sure you pick up a lot of long tail traffic you weren’t actually going for with SEO, but how is that a disadvantage? You decide which page search visitors see. With SEO, visitors can arrive on any page the search engine has in its index. Kind of implies SEO visitors could end up on any old page, but obviously the usual situation is that you’ll optimise one page to rank for 1 (or 2, or a small handful) of terms so you’d hope the page is going to be pretty well targeted. What? SEO certainly doesn’t have the locale control of PPC but I think we both know it’s untrue to say there’s no control of where your pages are seen. You can control when your ads are seen. SEO has no such control. Similar to the point that “pages can appear under a wide range of keyword terms”, I totally fail to see why this is a disadvantage. I know this is a brand new blog and you’re doing something different but this article is well below your usual standard dude, sorry. Oops, looking at the archive obviously not brand new, just new to me! Great post! Thanks for the valuable information. I will share with my twitterers. Nothing can grow a business as fast as ppc advertising; however, there are pitfalls that must be managed. Where once any business might do this themselves they now need to have a ppc manager that really knows how to protect them from buying poor-quality, non-converting traffic. Unless they are willing to dedicate the time to learn it well it may be best outsourced for many companies. The original AdWords could run on auto-pilot. Today’s AdWords and the ads running on other ppc engines must be watched like a hawk. I’ve written about the hazards and what to watch out for in a blog post I’ll link to this comment to make it easy to find. It has stayed in the Recently Popular section of my blog since it was published. The article is intended an overview and so deals in generalities. Agreed, PPC landing page optimization is a specialized process. SEO has far less control over keyword terms, and region display. The noise can make it harder to track, target and isolate metrics. In my experience, if you want ANY success, you have to start with PPC with new site and slowly work on the SEO. The SEO is going to take a long time, and a lot of links, but you don’t want to be DOA with your new site untilo all that transpires, if ever. The discussions I’ve seen about PPC rarely touch on what seems to me to be the first question anyone should ask. That is, can MY business make money with it? For example, if your average gross profit per sale is $75 and your competitors are paying $6 per click, if you matched this rate, you would have to have a conversion rate of 8% just to break even. (75/6 = 8%) If your non-PPC conversion rate is much lower than this, does PPC make any sense? I’ve heard that a 300% return on ad spend is convenient rule of thumb threshold for a successful ad campaign. This implies break-even at a gross margin of 33.3%. (The inverse of 300%) That is a reasonable margin for a service company or manufacturer. But if your gross margin is significantly lower than this, and the competitors for your keywords are service companies and manufacturers, does it make any sense to even start a PPC campaign? And when a business is brand new it has to get exposure somehow…buying a bit of it can be seen as a test expense that helps you get market feedback faster. If you can come close to breaking even on PPC in a saturated market then that increases the value of your traffic when you build out your SEO strategy. I even like buying traffic into non-commercial pages that are well done as a link building strategy. I worked as a PPC specialist at Google UK for 4 years during the period of Google’s unprecedented growth. 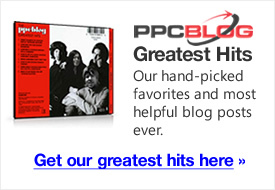 I’ll be blogging regularly, sharing my thoughts on Google PPC from an ‘insiders’ perspective. Agreed. Two pieces of the same puzzle here. SEO will always be the cheaper alternative – especially since google keeps pushing PPC prices to the extreme with its freebies. I agree that you need to have a budget for both. In the long run you need to spend more money on seo. This will ensure that you have a constant stream of traffic. Ultimately, unless your website is search engine optimised, the PPC will be less effective. Google ranks PPC ads not only on cost but also on their relevance to keywords within the website, so you can’t have an effective PPC campaign without a well-optimised site, although admittedly, PPC will have more instant effects on your traffic than SEO alone. You got great points covered on both ends. I agree with Robert when he mentioned that there shouldn’t be PPC vs. SEO because the truth is, both can be used to drive traffic to websites. While PPC focuses more on getting instant traffic and testing keywords in terms of conversion, SEO needs longer attention and focus to get more eyeballs to their sites. Now it really depends on the site owner which to prioritize. But on a more personal note, I would lean on SEO more for driving site traffic, even if the process takes longer than doing PPC. Isnt it true that eventually you can stop paying for your SEO due to residual, time served, history, etc. but with PPC when you stop paying you drop off the deep end? As my experienced. If you want fast result and has good budget then PPC is great option . If you want long term result then SEO is great option . Actually SEO and PPC are really two pieces of the same puzzle and should be used together. Excellent article and great and useful comments from all. We have had about a 500% return on PPC and with that keyword knowledge base are now building the SEO side. I agree that both SEO and PPC should be in an ongoing marketing budget. SEO is better but people new to the web ( I deal with startups ) understand ‘pay for adverts’ as a concept much better. It also makes it easier to compare with other forms of promotion such as mailshots,adverts in the press etc. etc. I push my clients to ppc and advise on seo later on, as it can take a long time to see the benefits.